This week, Come Fish Panama welcomed Ken and his lovely wife Bonny from Houston, Texas for a full day of offshore sports fishing. Bonny later revealed that she could hardly sleep the night before thinking about the offshore adventure to come. Soon after picking them up at the SeaGull Cove’s dock and giving them a safety briefing, we headed to the day’s fishing grounds. July in Panama usually means rain, but today was going to be a nice exception. Partly cloudy skies, light variable wind, smooth seas and blue water made it an almost perfect day to fish offshore, especially since the Yellowfin Tuna bite continues to be fantastic. with frisky Blue Runners, we made the remaining 10 minute run to Hannibal Bank for our first attempt at a bent rod. After slow trolling the humps for about an hour, the shotgun rig went off. 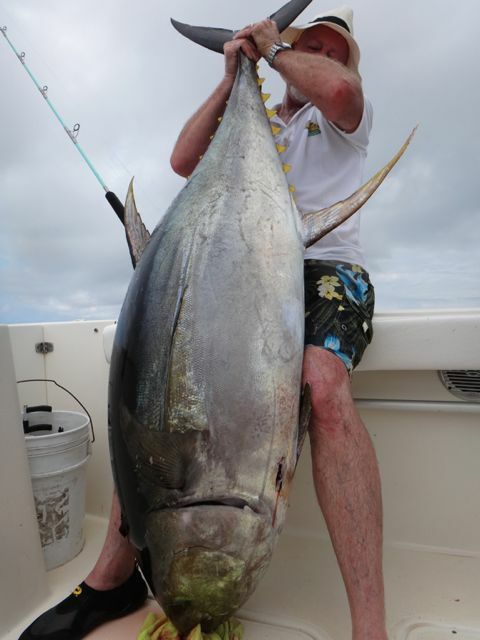 Ken grabbed the screaming Shimano Tiagra with an obviously heavy fish at the other end. After an epic battle, we had his Cow Tuna on the rail and hi-fives were handed out. We had an exhausted angler that had enough of giant fish for the day, so they decide for us to head to Isla Secas so that Bonny could bend a rod on a Roosterfish. But the rooster would have to wait for a bit longer. While heading north towards Isla Secas, I saw some top water action with birds and porpoises working the area just north of Isla Montuosa. As they say, “don’t leave fish to look for fish”. I asked Bonny if she would like to catch a 20-60 pound Yellowfin before chasing a Roosterfish and she jumped at the opportunity. My Mate, Jose, quickly threw out a Blue Runner and almost instantly Bonny was hooked up on spinning gear with what turned out to be a beautiful 80 Yellowfin. The day was quickly coming to an end, but we gave the Rooster a 30 minute try. Hooked two Pacific Needlefish later, we had to call it a day without a Roosterfish in the photo collection. We would like to thank both of these anglers for joining us on this beautiful July day. We truly look forward to seeing them both on a future Come Fish Panama charter in the future. Ken and Bonny were so relaxed throughout the day that I can see they were enjoying their Tropical Panama Vacation. Ken with a small Dorado!! !